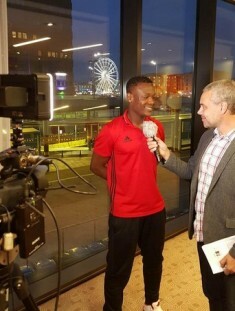 Former Nigeria U20 international Alhaji Gero scored a goal in the second half as Oestersunds FK beat Hammarby 2-0 in the Swedish Allsvenskan at the Jämtkraft Arena on Wednesday evening. Hammarby were close to setting a new record for the most consecutive clean sheets in away matches (seven) but failed when Gero netted in the 75th minute after he was set up by Alex Dyer. The Nigerian striker appeared off the bench in the 59th minute for his 20th appearance in the top-flight this season. He opened his account for Oestersunds FK on October 1, bagging two goals and two assists in the 6-1 rout of Hakeem Araba’s Falkenberg . Graham Potter’s side occupy the eighth position on the table with two rounds left.